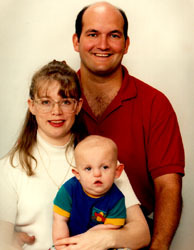 Meet the terrific trio: Ruth, George, and son Anthony. Anthony is almost eighteen months old and is growing with leaps and bounds. He was diagnosed at birth with an abnormality on chromosome #19. It has presented him with several challenges, but the two major ones are a single right kidney and abnormal muscle tone. He has low tone in the upper portion of his body while having high tone in his lower extremities. Anthony has blossomed in the past few months and is keeping Mom very busy as he learns to sit with support and progresses toward crawling. This "young musician" likes toys that make noise and play music. He has created his own unique dance style. George's job as a military support person has required him to be out of the country for months at a time. Dad is now back home. Ruth stayed at home to care for Anthony until recently, when he began attending child care. Ruth is now employed and is active in many community activities. Anthony receives all of his support services in natural environments including his home, a child care center, and a play group at a local church "Mother's Morning Out." 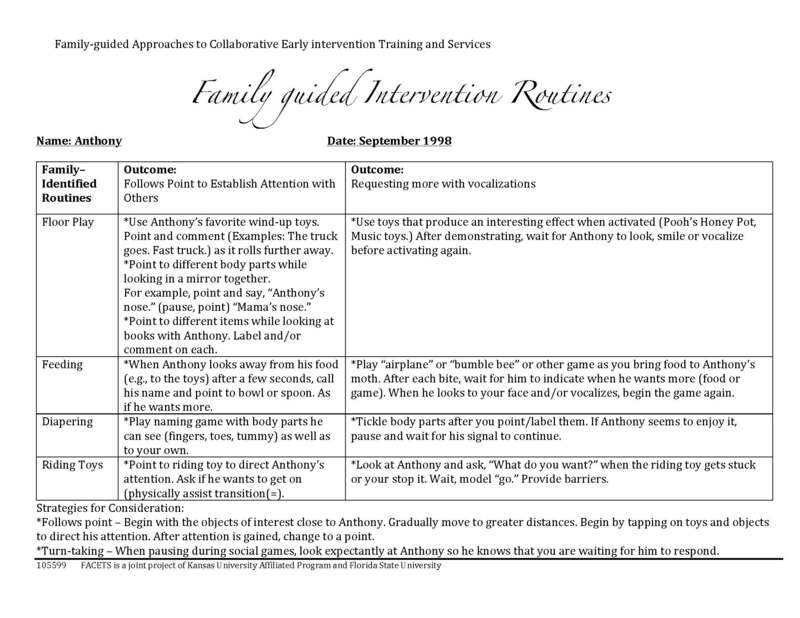 Anthony's early intervention team, including his family and careproviders, designed the following plan for targeting the identified outcomes throughout his day. This activity chart, while not meant to delineate specific methods, cues, and contingencies, served as a written reminder to all facilitators for strategies to promote acquisition of skills.